Any high-speed accident can be frightening and dangerous. But what could be more furious and terrifying than a rollover accident? Drivers in Florida experience roughly 600 rollover accidents every year. There are a number of elements that may impact rollover accidents. What takes an already dangerous situation and amplifies it to a rollover? Routine driving: studies indicate that nine out of ten fatal rollover accidents occur during routine driving on straight roads or on curves. The implication is that these incidents are closely tied to driver distraction, impairment or speed. Type of vehicle: while any vehicle may be involved in a rollover incident, high profile, narrow vehicles such as vans, pickup trucks and SUV’s are more susceptible due to their design. 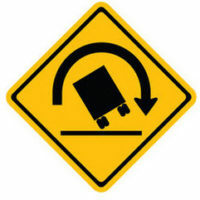 Speed: Roughly 40 percent of fatal rollovers are connected with excessive speed, and 75 percent of fatal rollover accidents occur when the posted speed limit exceeds 55 mph. Driver impairment: Almost 50 percent of fatal rollover incidents are alcohol-related, meaning blood alcohol levels exceed 0.0, even if they may not surpass legal limits. Clearly, any amount of mind-altering substances in the blood system can impact judgment, reflexes, and ultimately, safety. Location: Undivided roadways are most frequently associated with rollover accidents. Nearly 75 percent of rollovers occur on rural highways. What Can Drivers do to Avoid Rollover Fatalities? Rollover statistics are alarming. These incidents are frequent and fatal. What can you do to protect yourself in these deadly accidents? Consider choosing a vehicle with a wider wheelbase and lower center of gravity. Minivans and high-profile 4-wheel drives are not as close to the ground, and thus are less stable on the road. Avoid overloading your vehicle, especially having heavy loads on the roof of the vehicle. Heavy cargo is safest when placed low in the vehicle and as close to the center of the vehicle as possible. Insist everyone in the car is buckled up. Far more than half of fatalities in rollover incidents involve individuals who were not wearing their seatbelts. The violent jarring that occurs with a rollover can result in head injuries, being thrown from the vehicle, and other fatal injuries for unsecured passengers. Choose a vehicle with up-to-date safety features such as side-curtain air bags and electronic stability systems. Take turns more slowly. “Tripping” up against a curb due to high speed on a curve can destabilize a vehicle. Drive appropriately for conditions: Wet roads or foggy conditions require less speed and more focus. Drive cautiously. Maintain tire balance. Check the air pressure in vehicle tires regularly, and have tires rotated and balanced professionally as needed. Avoid impaired driving. Driving under the influence of alcohol or drugs, even legal medicines, can lead to erratic driving. Avoid tailgating or driving too close to other vehicles. Make sure you have plenty of room to adjust to other drivers who may be unsafe. What Happens After a Rollover Accident? If you or a loved one has been involved in a rollover, or any other type of highway accident, our experienced attorneys in Daytona and Ormond beach can make a difference in the way your future plays out. Contact the compassionate, effective team at the Law Offices of Robert W. Elton today for a free, confidential consultation.